Scrambled Eggs - Again! This Time With an Optional Side of Bacon. There WILL be SOME POLKA! Hiya, Stashu, and good morning Stashu yolks far and wide. Goooood morning! I'm egg-static that Stashu is here again today. Thanks Dad! :) You are probably the best person ever! This Haddaway is the creation of Cologne producer Tony Hendrick. (He has a modestly successful past in Beat and Prog / Krautrock). YOU THE BEST DAUGHTER IN WHOLE WORLD !!!!! Find that song by Los Microwaves Time to get up. Marty played it a long time ago. Happy Valentine Day MYSZKA !!!!!!!! Kurt Gottschalk played some nice polka on his fill-in last night. It was eggs-cellent. You work monday to friday ? Christie will be at White Castle. It's probably better that way, except for Harold & Kumar. G'morning Stashu! Digging this Fissunix. Fun show! hey pierre, have you been in hiding? Ausmanx, no, I just got a bit carried away by work, and such. Good morning to you, Stashu! Ooh Dire Straits, where's my headband?? When I think Stashu, I think upbeat ! I'd be lying if I said I didn't miss Dance with Me, Stanley last night, but 2 mornings of Stashu in a row makes up for it. Dance With ME Stanley will be back this upcoming Monday at 8PM! :) Thanks for being here and being there and being everywhere. Shout out to my peeps. Personal and the Pizzas! Best Hoboken band who aren't really from Hoboken ever! Where are they from then? San Francisco I think. Apparently Hoboken is where a bunch of guys from California think a pizza-themed band should be from. I'm spending Valentine's Day at the dentist. Do you have any dentist songs? I have yet to find someone who dislikes pierogi. You'd have to be crazy not to love those bundles of carbs. I had sweet potato pierogi on Sunday. Great European deli in South River makes great pierogi. They also make their own kiebasi. It's pretty awesome. They smoke all their own meats. Thank you for the Polka Stashu! The best part of my morning so far. But anyway, good morning all. 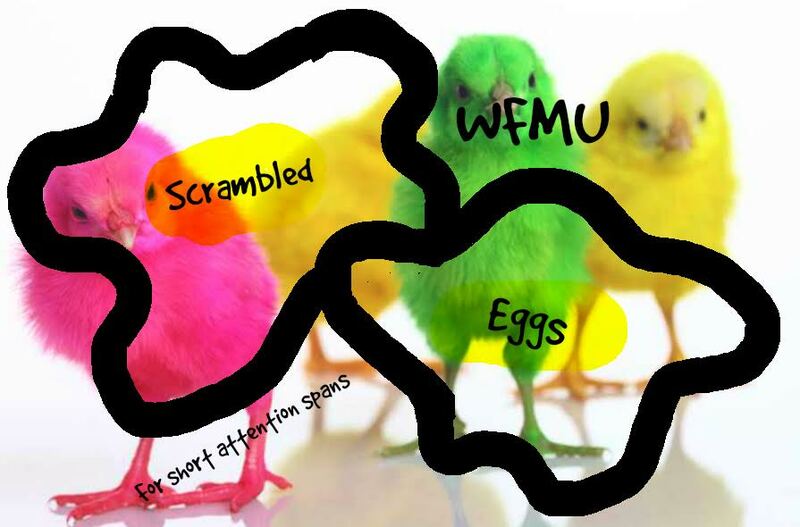 WFMU is my grading music. I need breakfast. I wish there was a Grammy Award category for Best Morning Show. The winner is right here! I love the Grammys. Beyonce was the best she should do the morning show! Beyonce if you're on the comments board- speak up! I hope she doesn't go all Hollywood with her twins' names, like calling them Thing One and Thing Two. DOG-TYPEWRITER-BREAKFAST. Is there that involves these topics? There is a dog typing under this lemon tree about breakfast. I do believe I'm going to change my fake internet name to Hammond Deggs. happy valentines day to all of you happy people!! Hey, nice little morning show you have going on here. Can you play some My Bloody Valentine? Crab cakes for breakfast? Can't be beat! @stashu fried egg with spinach & cherry tomatoes. hiya stashu and all, have a wonderful day! Tearing it up this moorning! You THINK you have the kishka... I have the REAL kishka, and I'm not sharing, love that stuff! HAPPY HAPPY ! ! ! Great car company once again, enjoyed the show! Polka time Monday at 8! Why am I listening to a song about a clown dying? Sad! Bobby Vinton in the morning? Somebody got lucky! The listener!!! Thanks Stashu! This was fun!! Mam nadzieję, że masz dobry dzień!